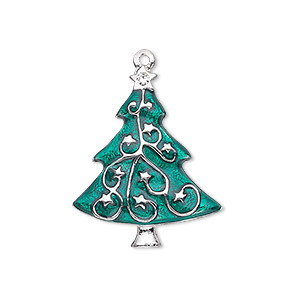 Charm, enamel and pewter (tin-based alloy), 18.5x12mm Christmas tree. Sold per pkg of 2. Design for the holidays with themed charms for making charm bracelets, necklaces and earrings, or to embellish gifts and home décor. 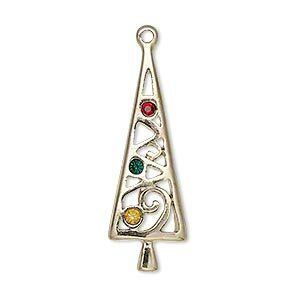 Charm, gold-finished "pewter" (zinc-based alloy) and enamel, green / red / blue, 20x19mm single-sided Christmas tree. Sold per pkg of 2. 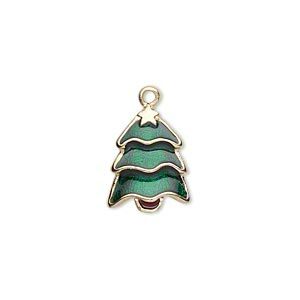 Charm, gold-finished "pewter" (zinc-based alloy) and enamel, green and red, 23x15mm single-sided Christmas tree. Sold per pkg of 2. 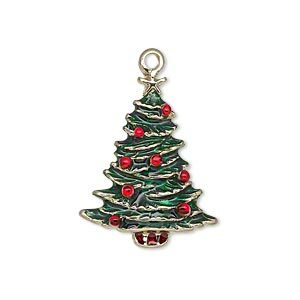 Charm, gold-finished "pewter" (zinc-based alloy) and enamel, green / red / white, 21x18mm single-sided Christmas tree with "Merry." Sold per pkg of 2. 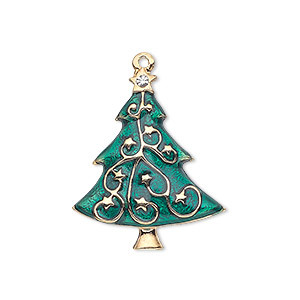 Charm, gold-finished "pewter" (zinc-based alloy) and enamel, green and brown, 16x12mm single-sided Christmas tree. Sold per pkg of 2. 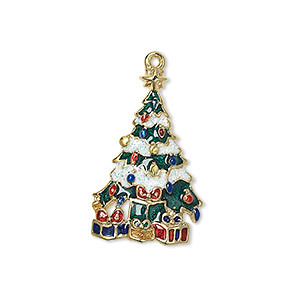 Charm, enamel and gold-finished "pewter" (zinc-based alloy), multicolored with glitter, 26x16.5mm single-sided Christmas tree. Sold individually. 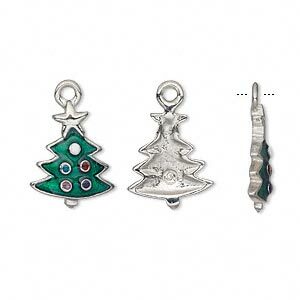 Charm, enamel / Swarovski® crystals / silver-plated "pewter" (zinc-based alloy), green, 34x11mm single-sided Christmas tree. Sold individually. 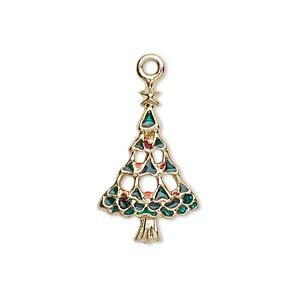 Charm, enamel/gold-finished "pewter" (zinc-based alloy) and Swarovski® crystals, red/green/yellow, 34x11mm single-sided Christmas tree. Sold individually. Charm, enamel / Swarovski® crystals / silver-plated "pewter" (zinc-based alloy), green and crystal clear, 27x22mm single-sided Christmas tree. Sold individually. 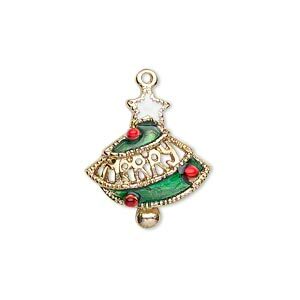 Charm, enamel and gold-finished "pewter" (zinc-based alloy), green and red, 26x20mm single-sided Christmas tree with star. Sold individually. 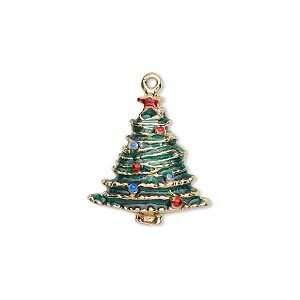 Charm, enamel / Swarovski® crystals / gold-finished "pewter" (zinc-based alloy), green and crystal clear, 27x22mm single-sided Christmas tree. Sold individually.